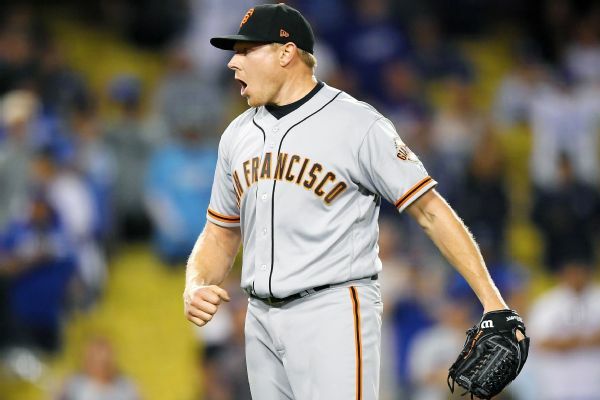 The San Francisco Giants activated closer Mark Melancon from the disabled list on Wednesday. The right-handed reliever has been on the disabled list since May 9 because of a pronator strain near his right elbow. The original plan was for Melancon to return Friday, but he threw a bullpen recently and "felt great," according to manager Bruce Bochy. "He's adamant he's ready to go and he's our closer," Bochy said, according to the San Francisco Chronicle. "Why wouldn't we activate him?" Melancon, 32, signed a four-year, $62 million contract as a free agent in December. The right-hander has a 2.53 ERA in 11 appearances and has converted six of his first eight save opportunities for the Giants. To make room for Melancon, utilityman Kelby Tomlinson was sent down to Triple-A Sacramento.